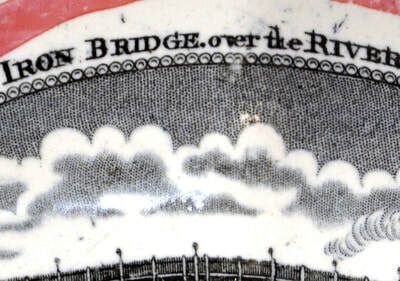 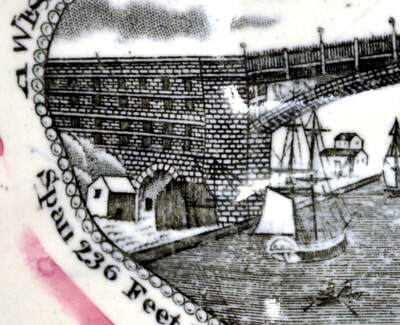 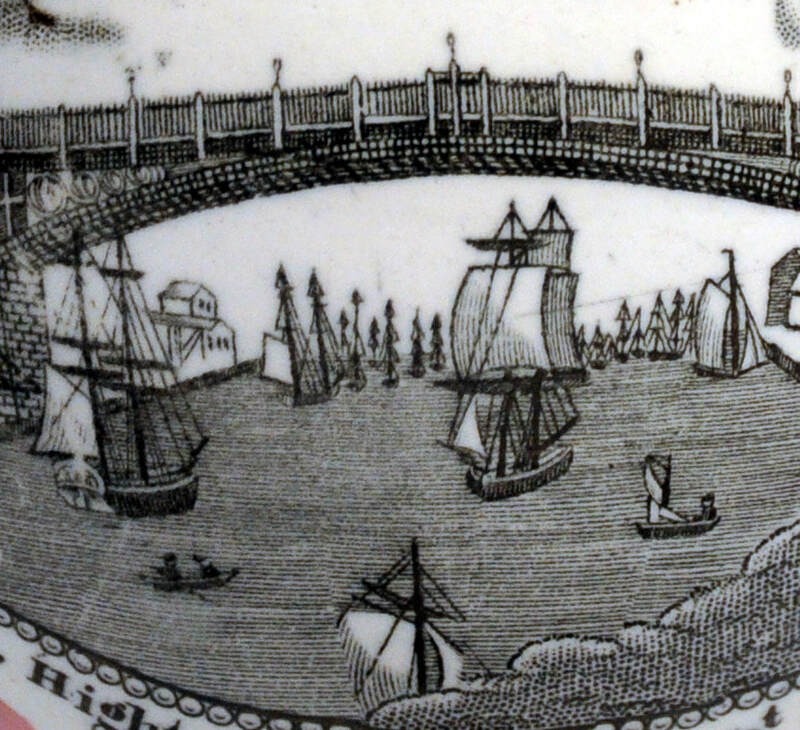 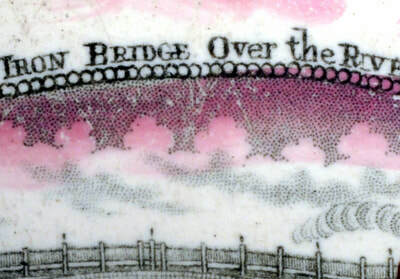 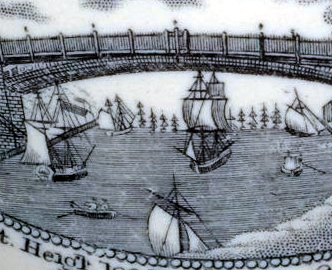 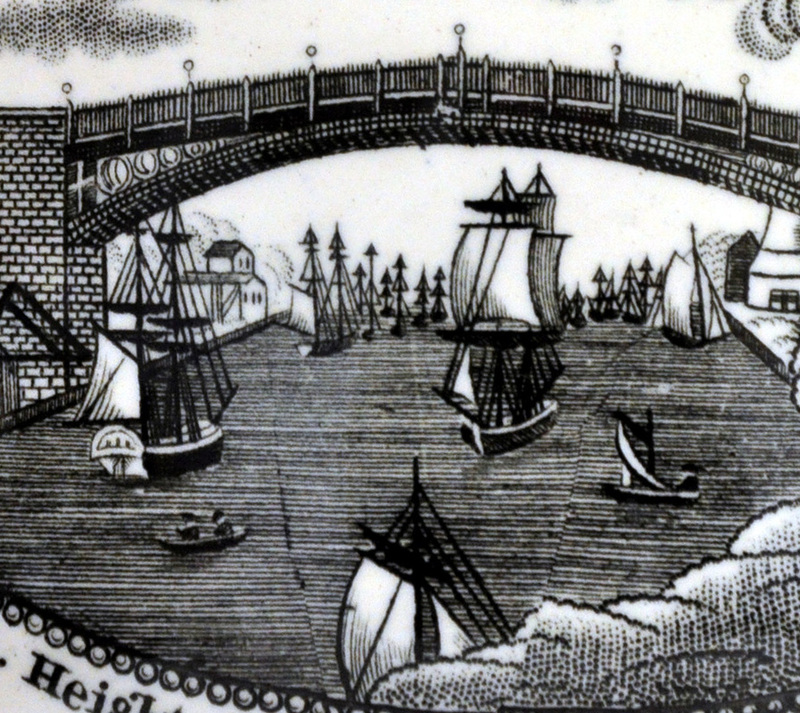 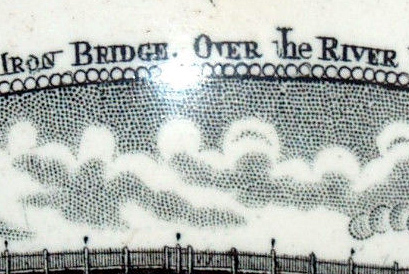 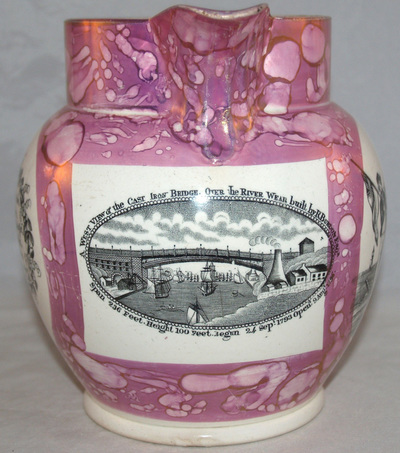 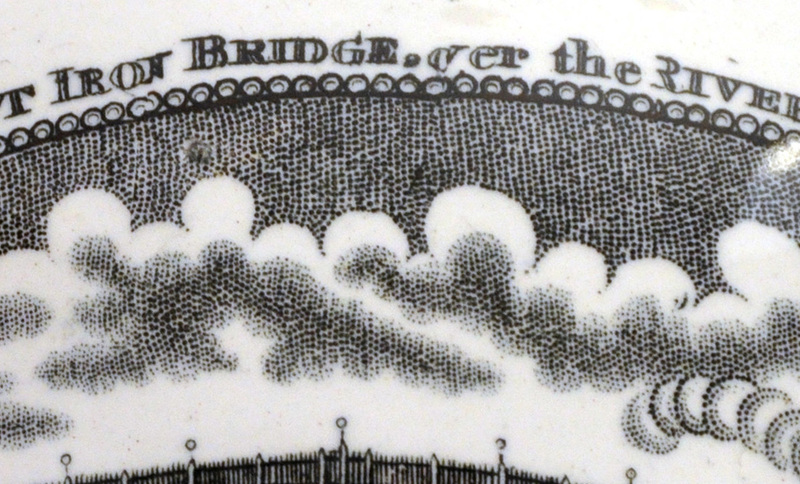 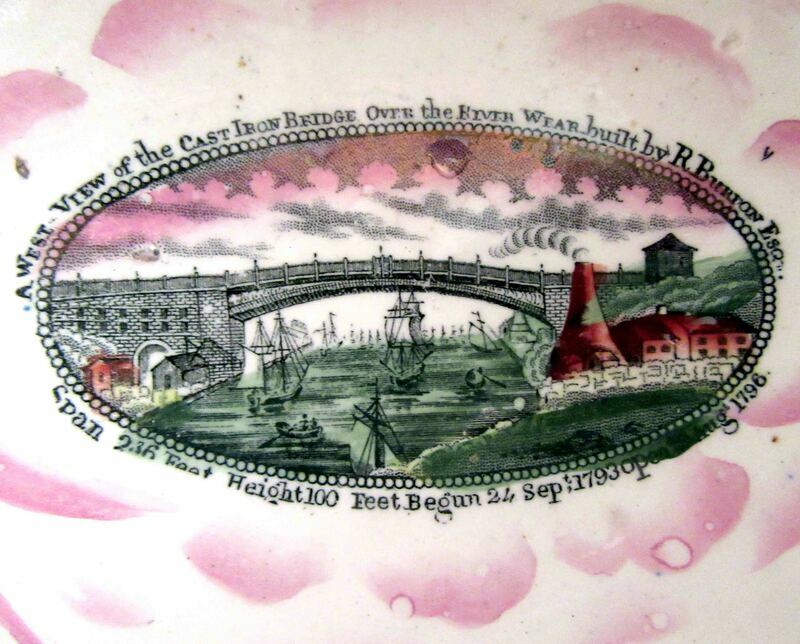 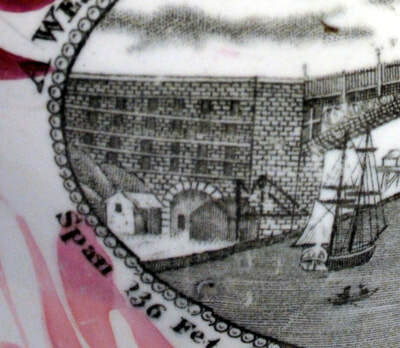 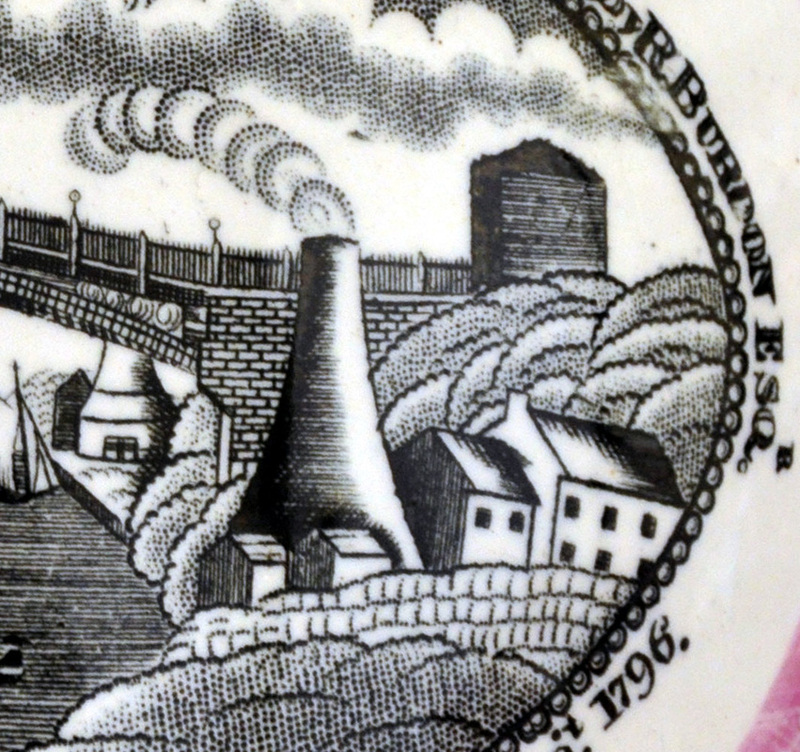 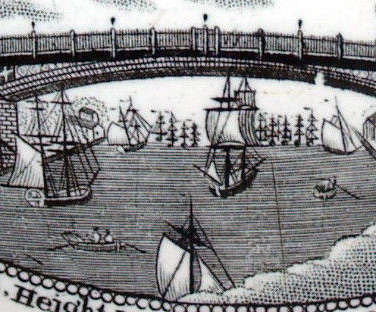 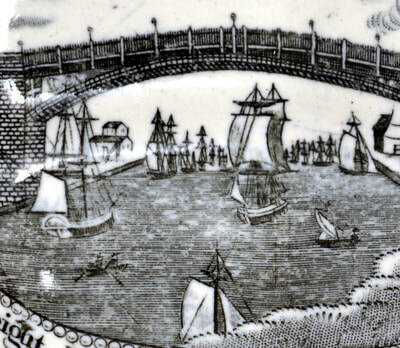 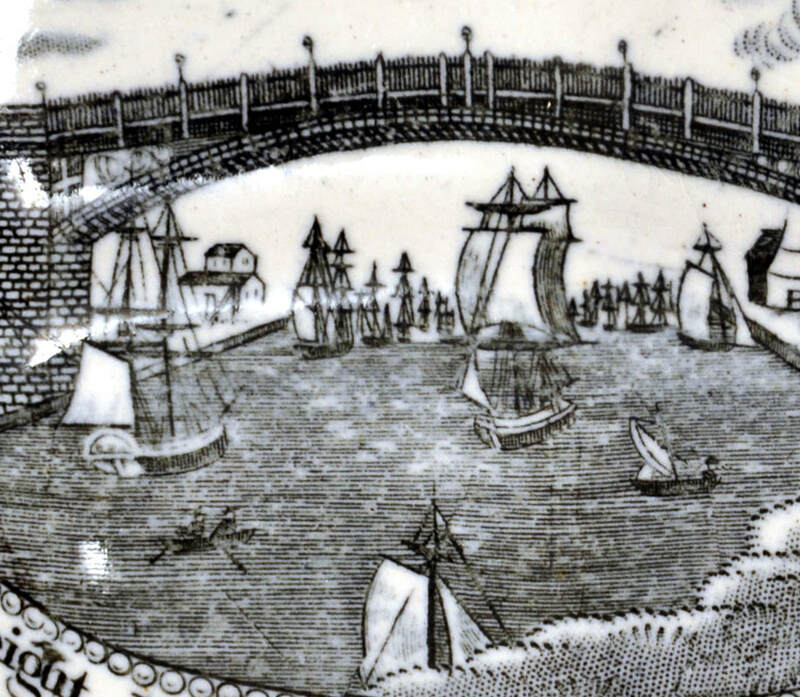 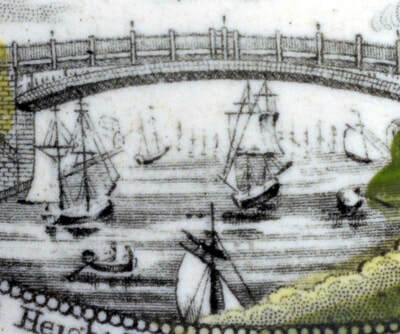 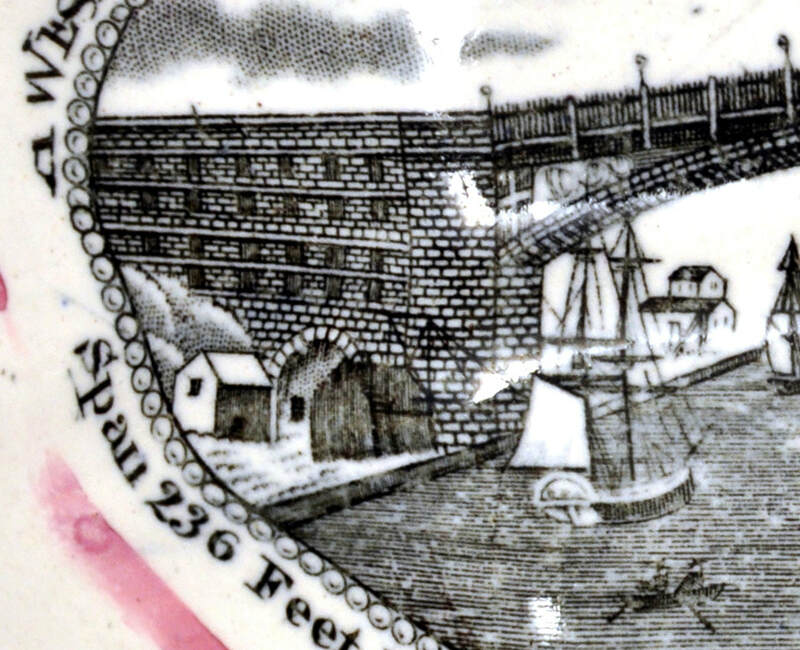 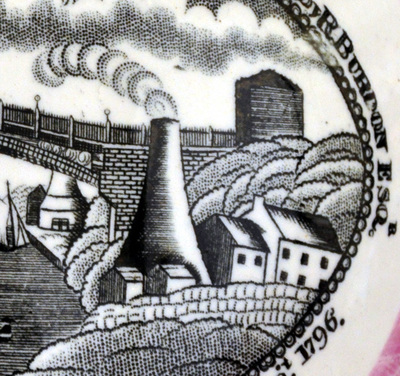 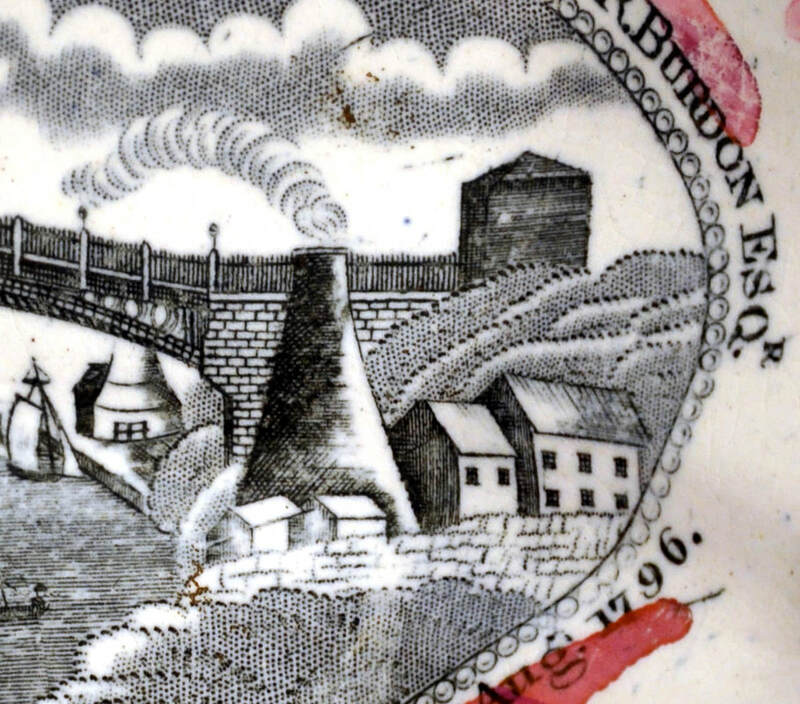 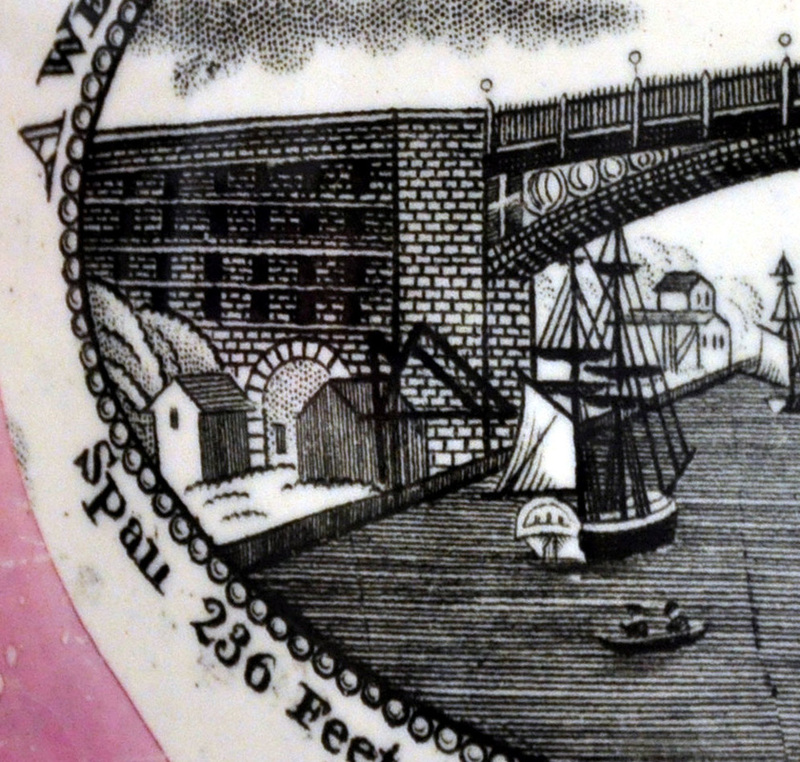 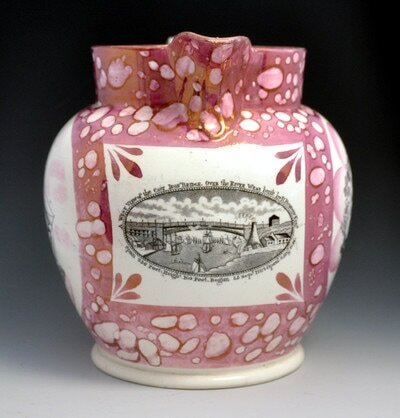 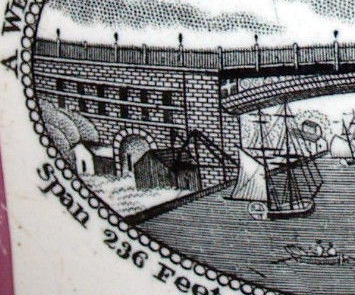 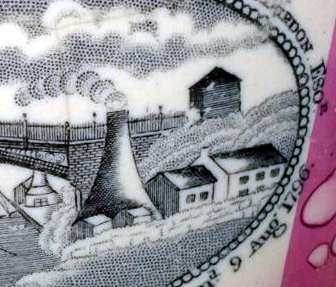 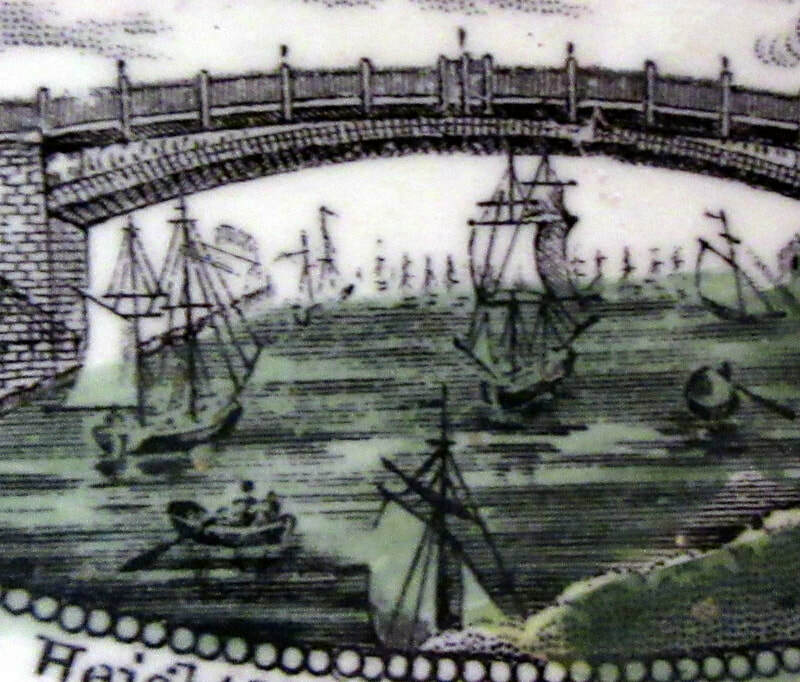 This is the most common view of the Bridge over the River Wear, and was used by many potteries. 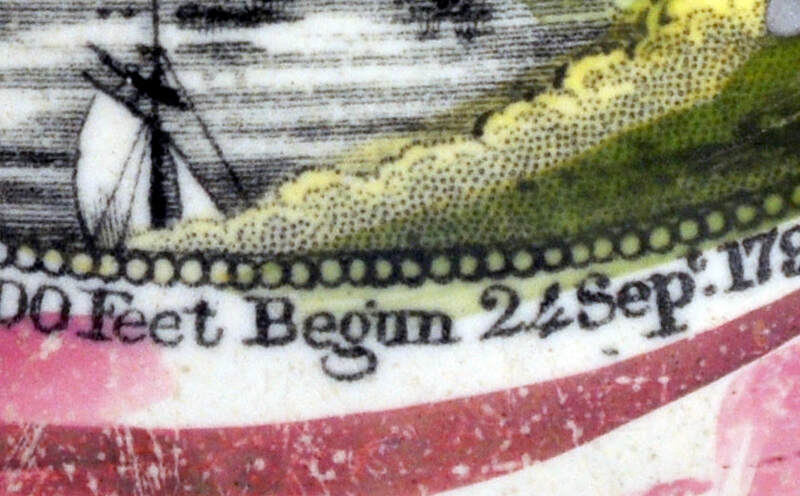 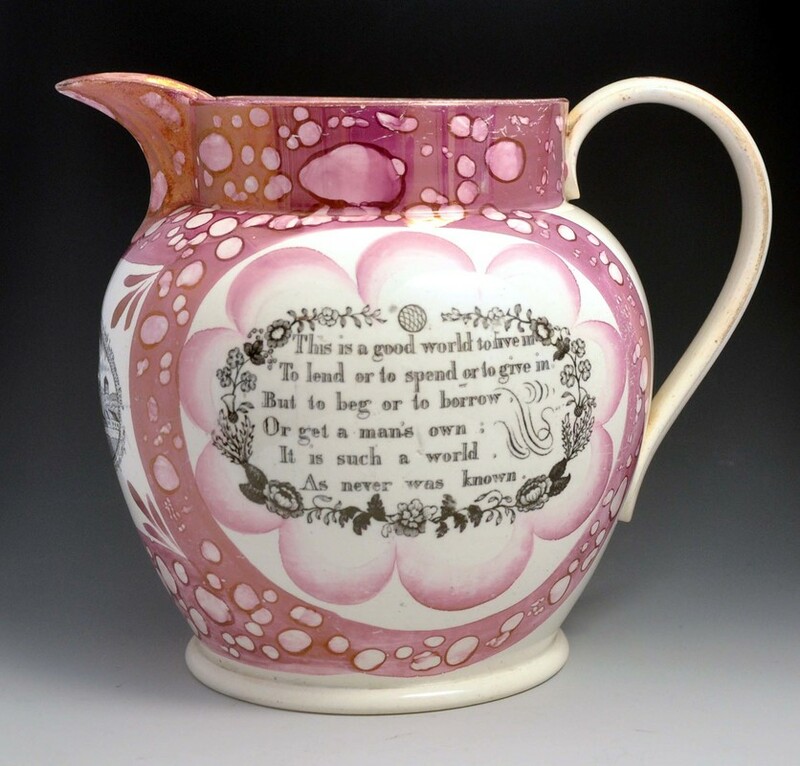 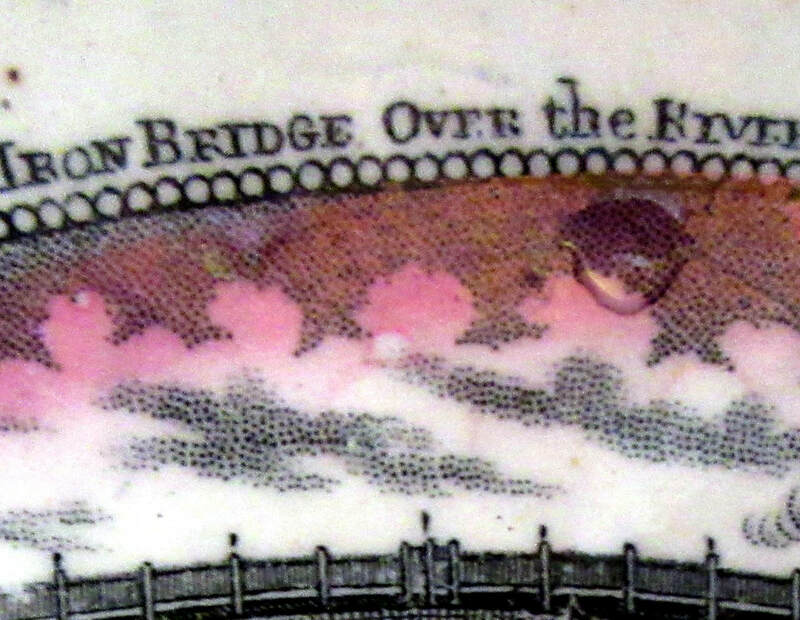 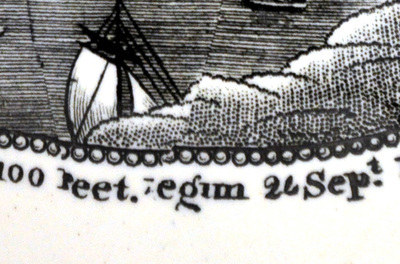 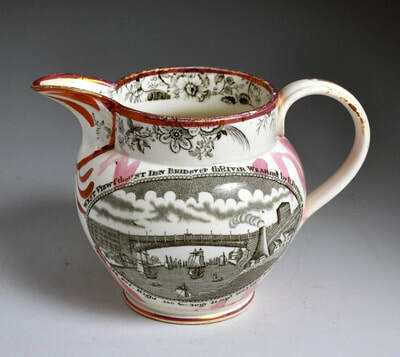 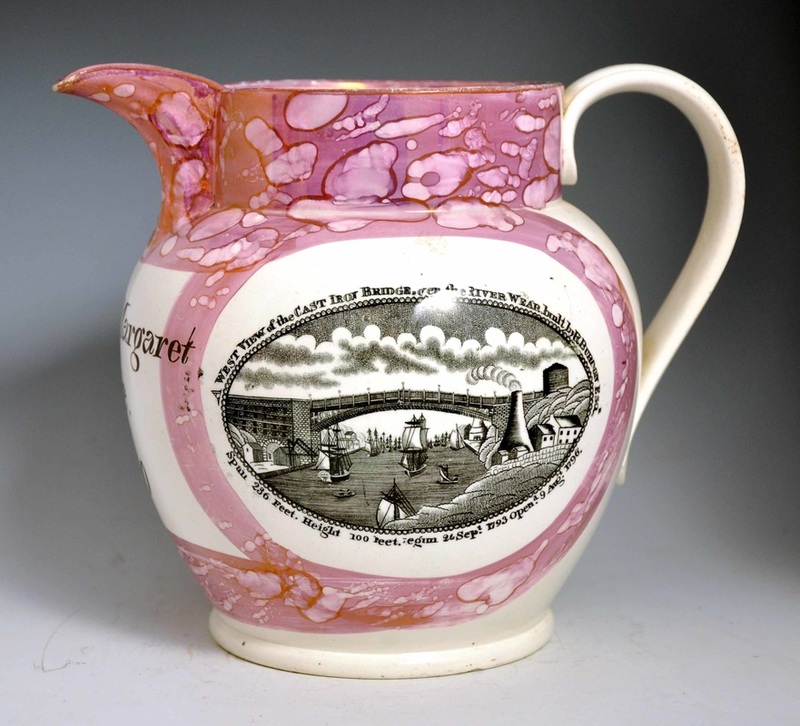 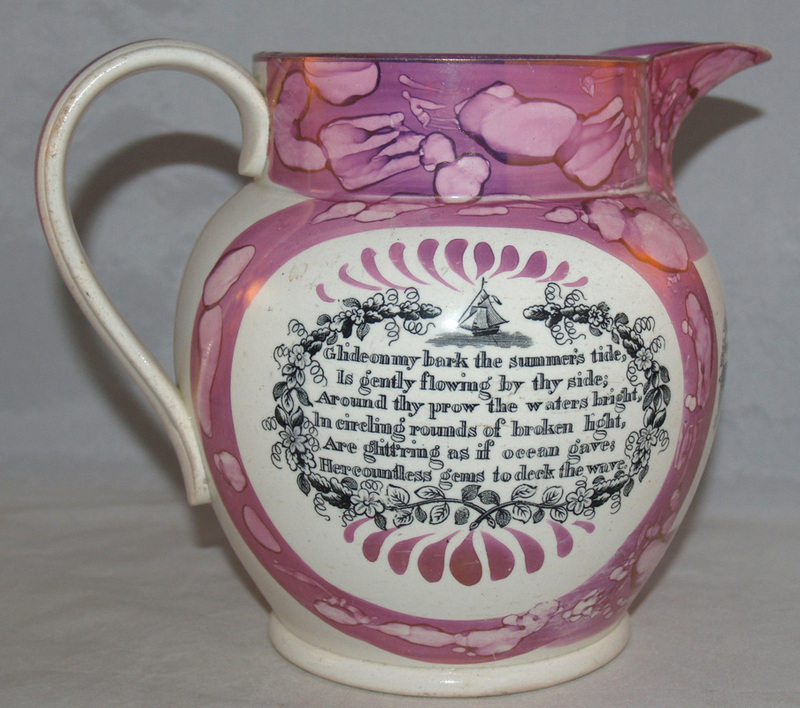 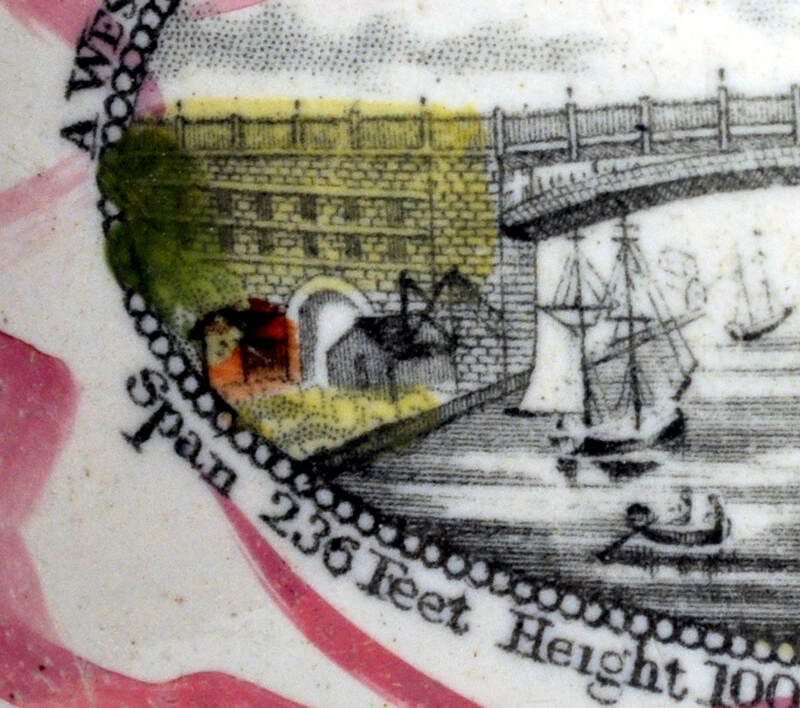 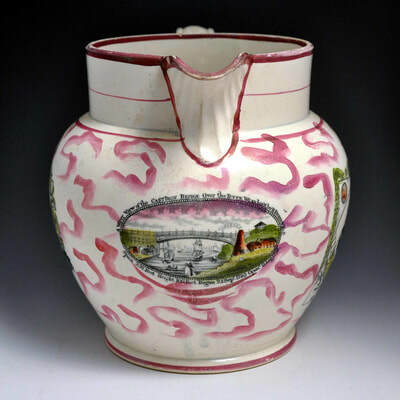 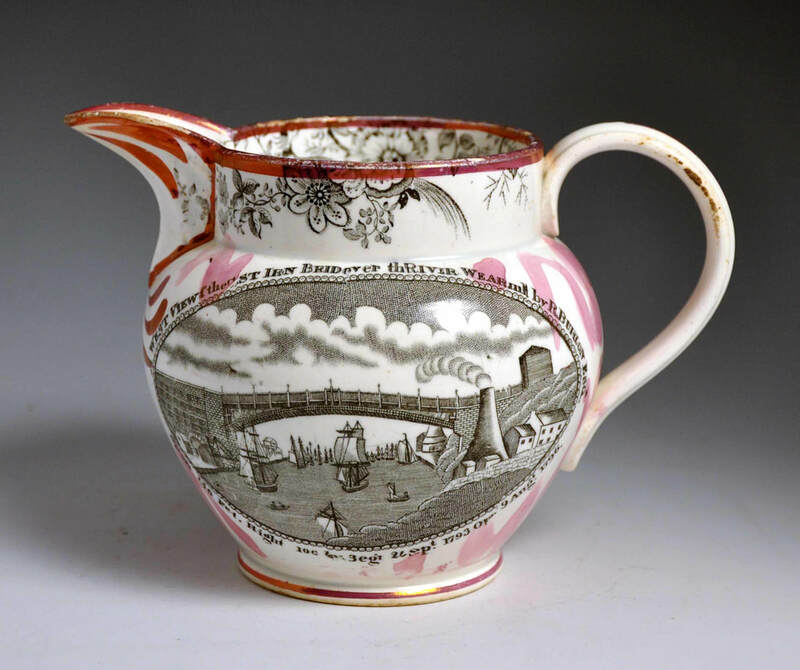 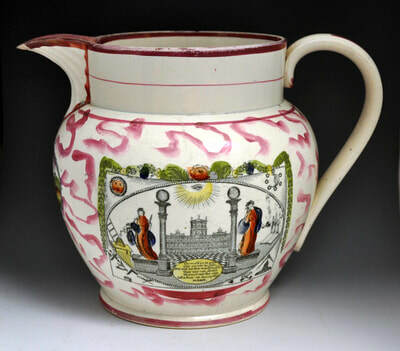 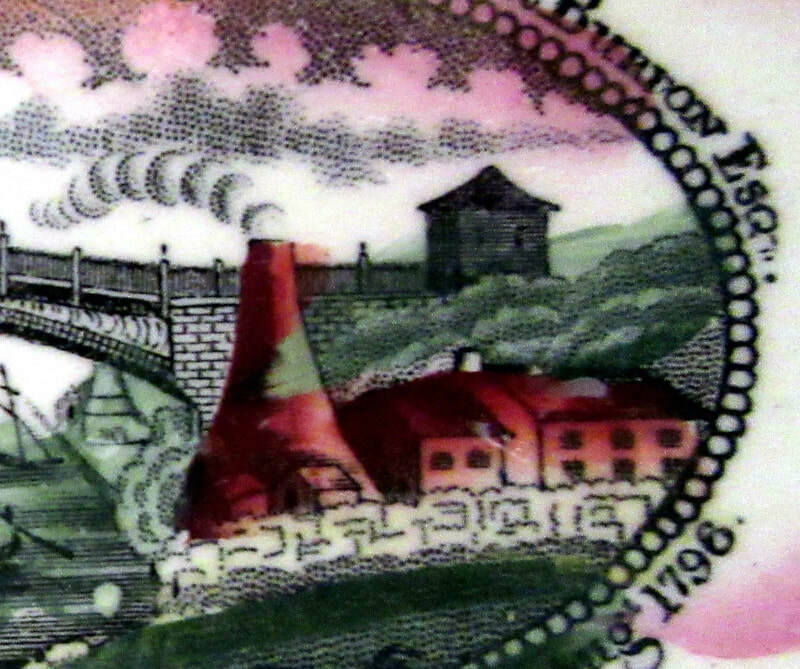 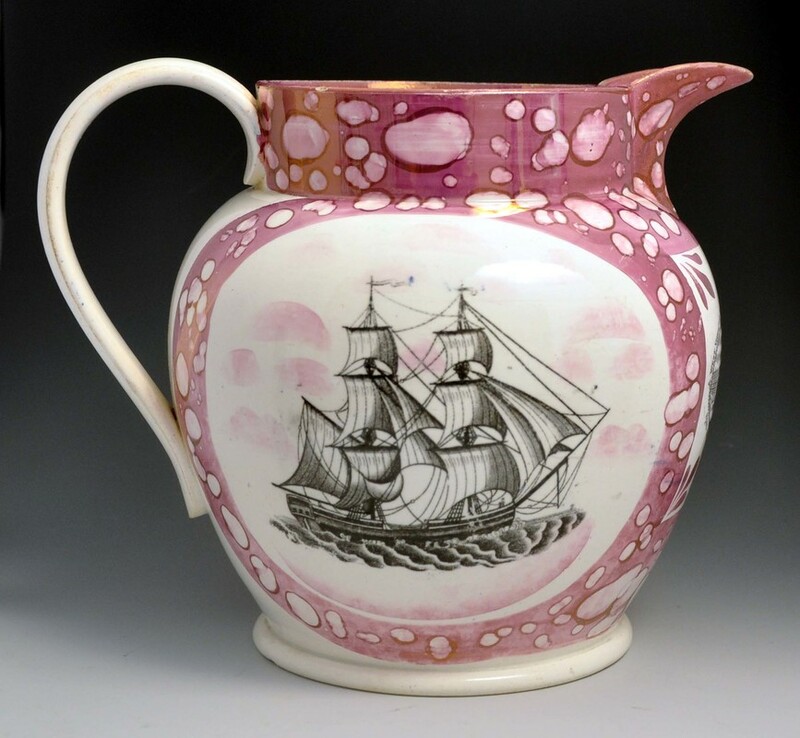 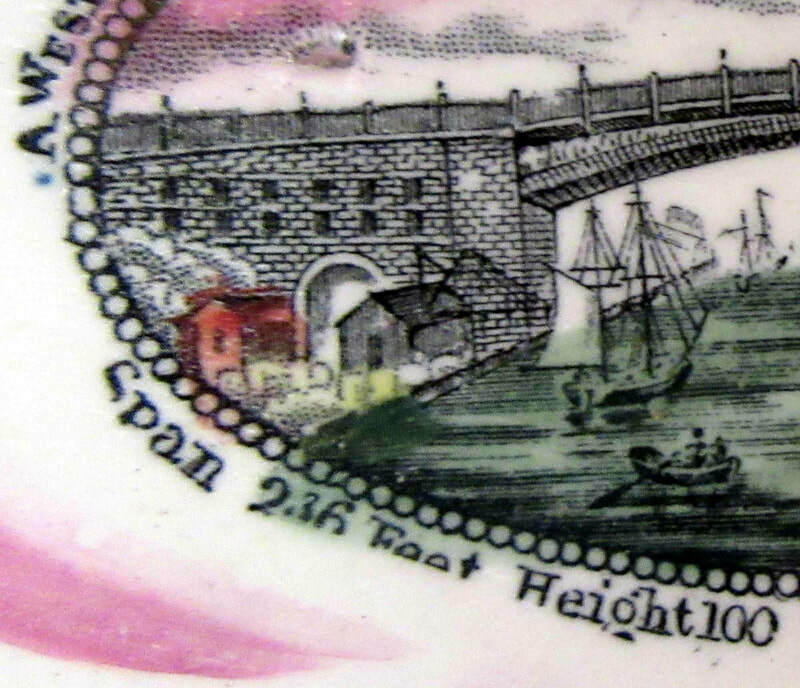 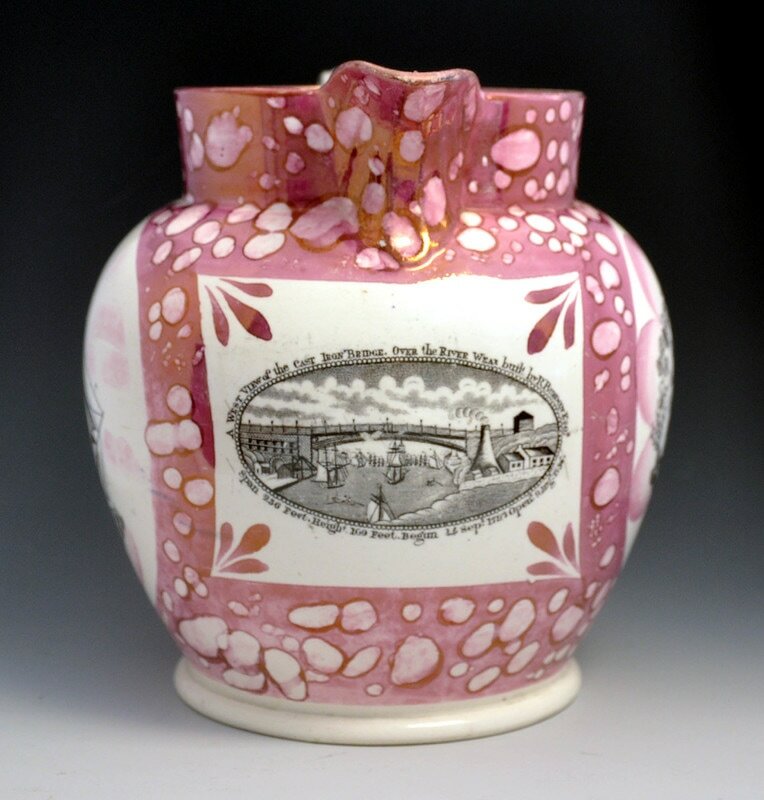 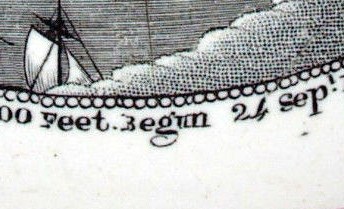 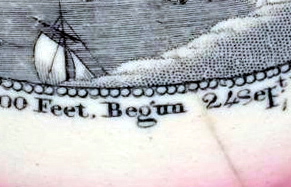 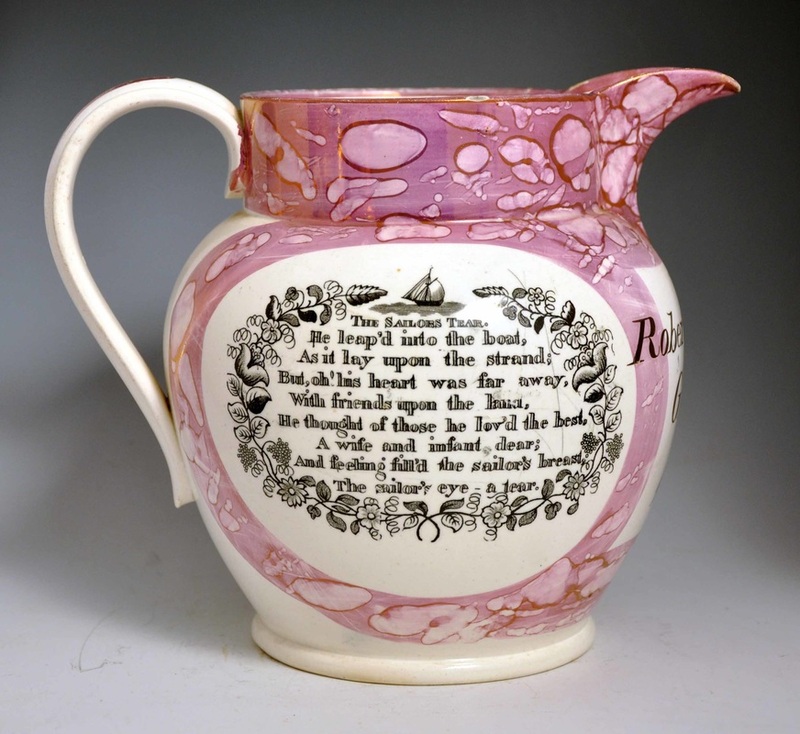 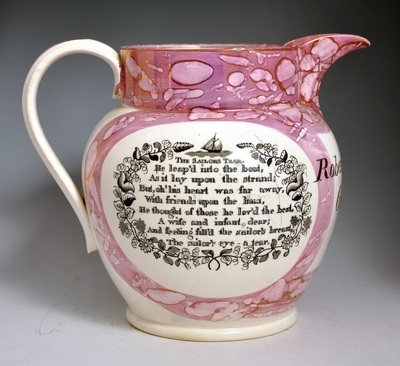 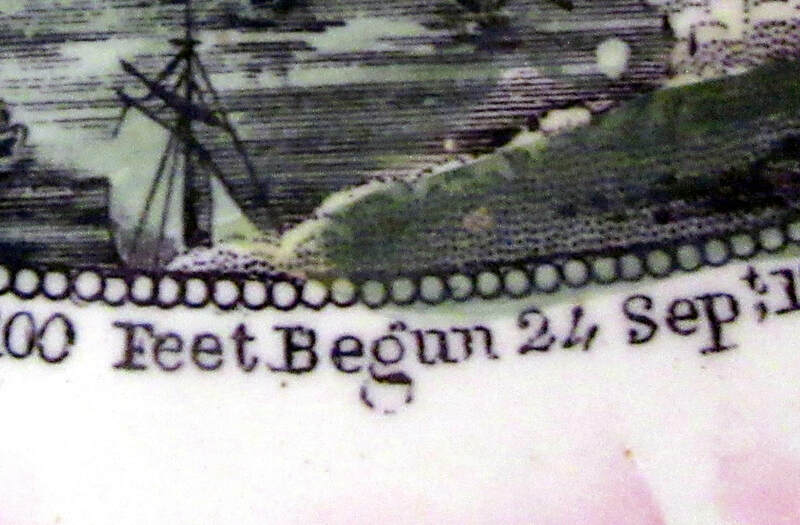 The Garrison Pottery (Dixon's) used multiple very similar variations of this transfer, which merit a page of their own. 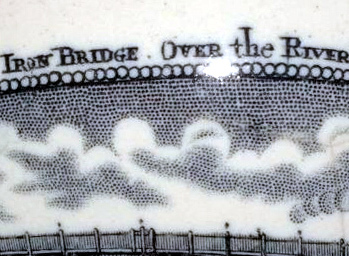 8 rings of smoke from chimney (top right detail). There are no railings on the left side of the bridge. 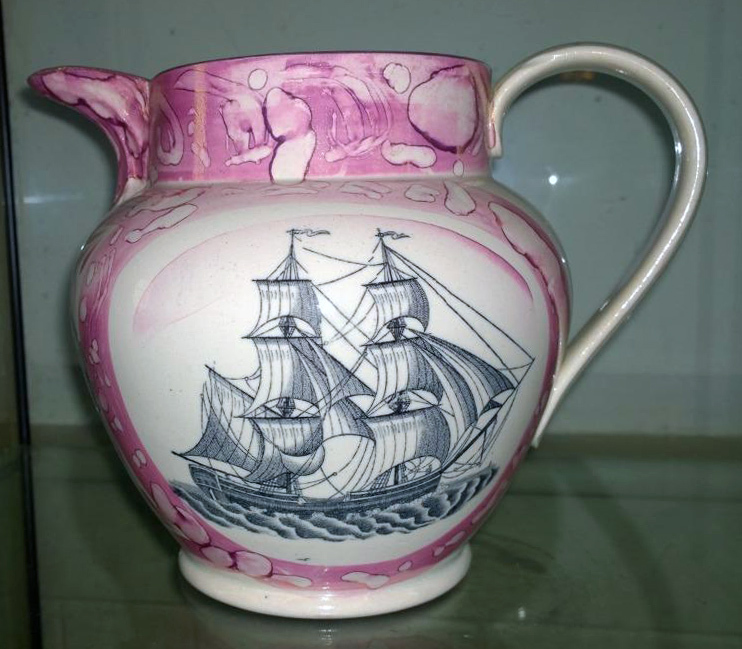 This transfer also appears on smaller Dixon jugs. 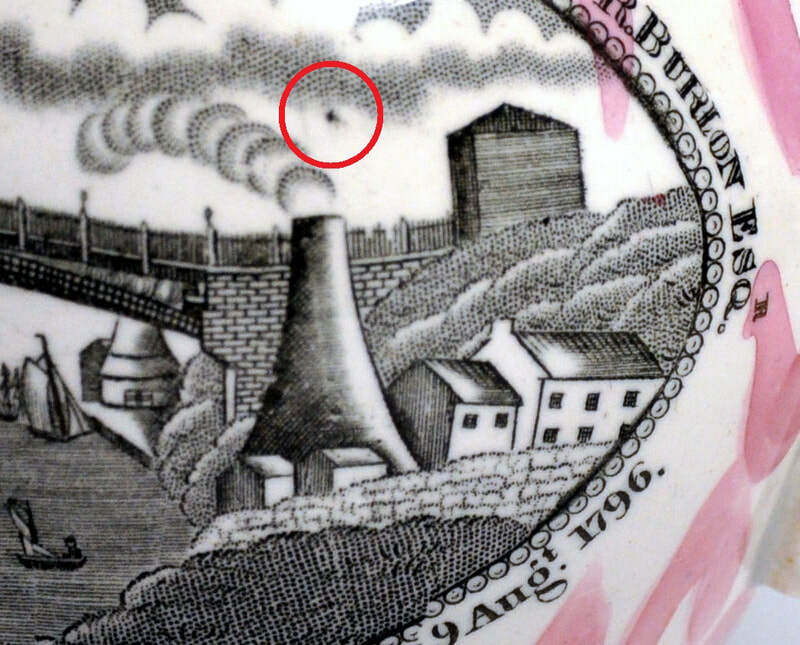 Note the dark speck just above the right edge of the chimney top. 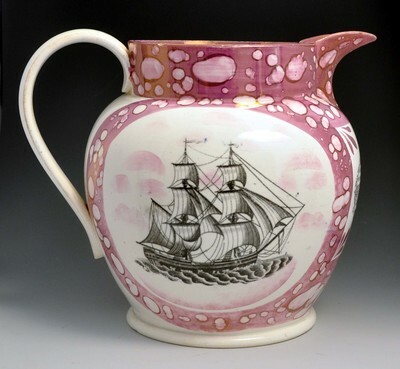 This transfer is smaller, and used under the spout of the jug. There are 9 rings of smoke coming from the chimney (top right detail). 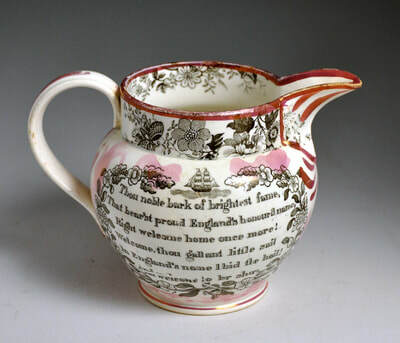 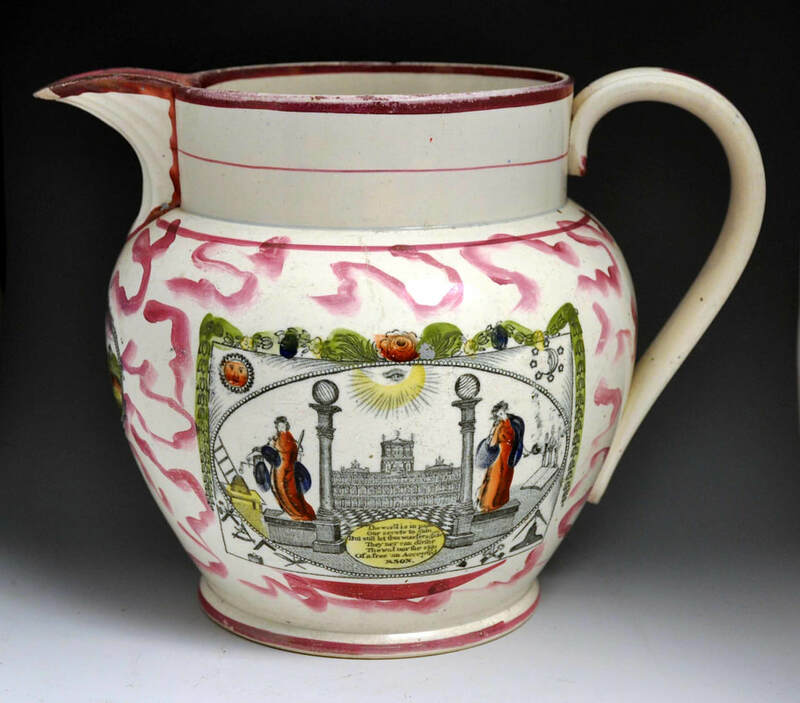 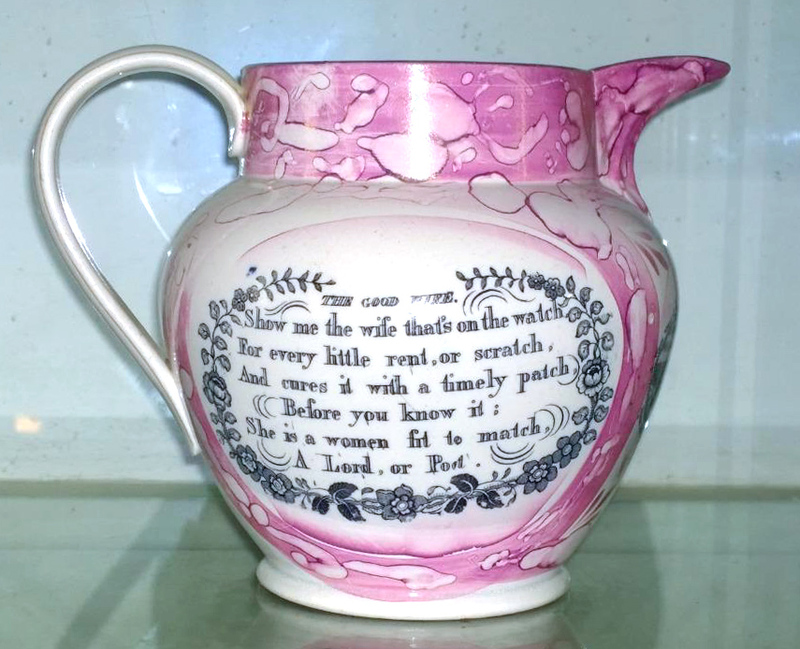 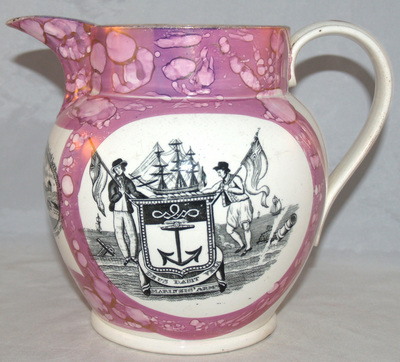 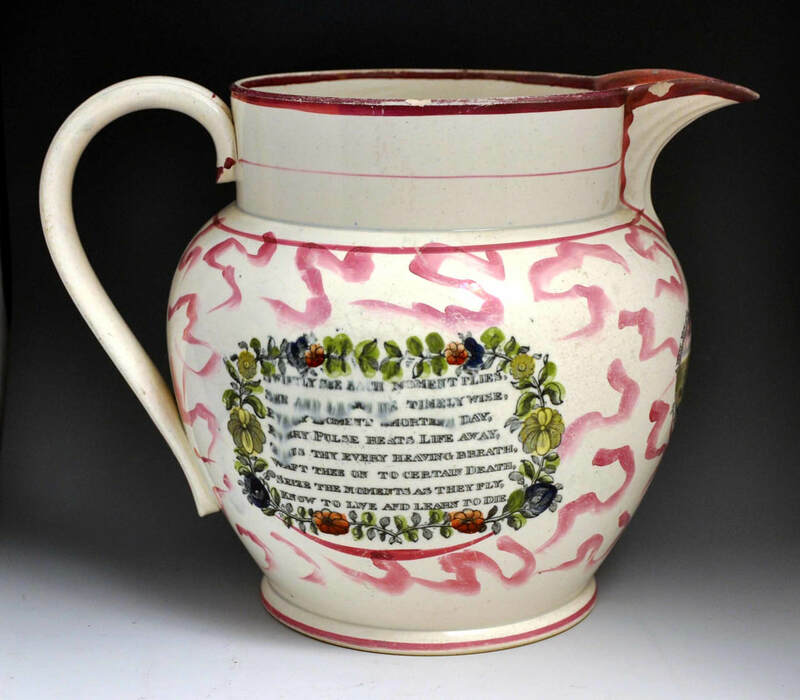 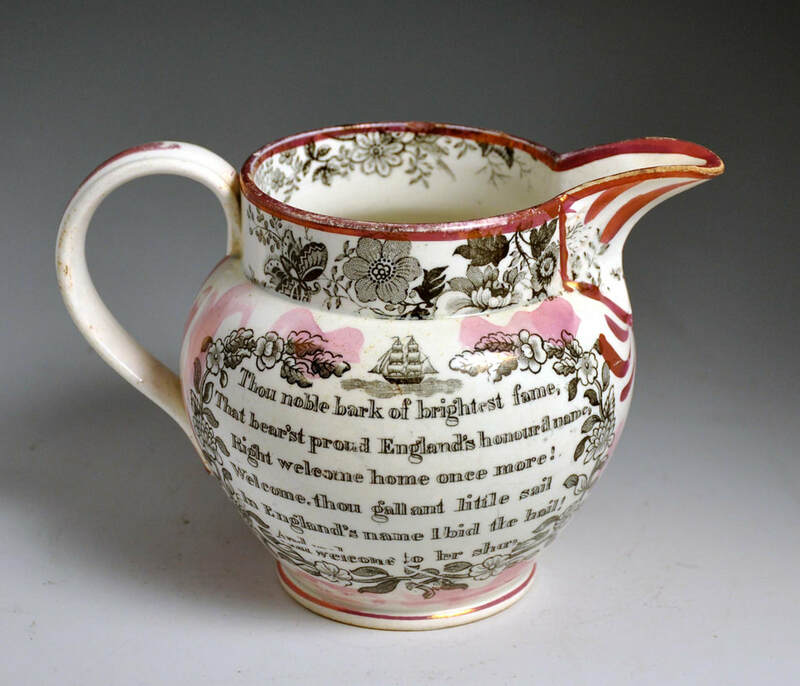 The jug is unmarked, but has typical late 'Dixon' decoration, c1860. 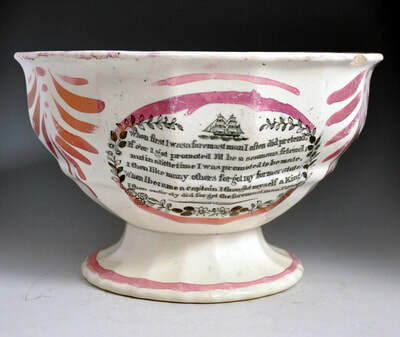 Another small transfer, this time used in the inside of a chamber pot. 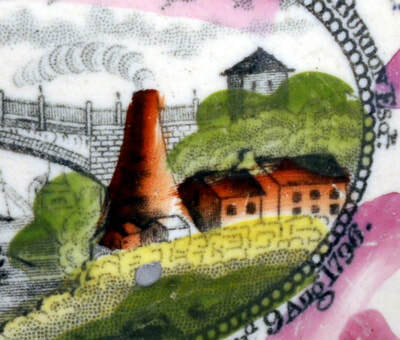 There are 10 rings of smoke coming from the chimney (top right detail). 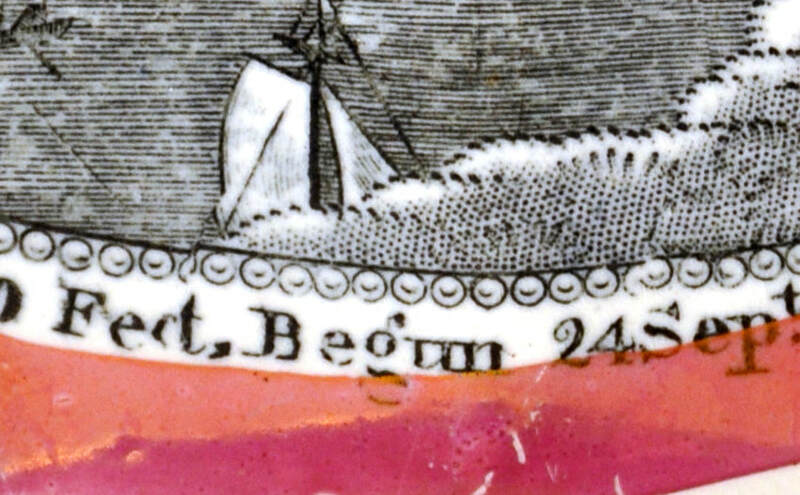 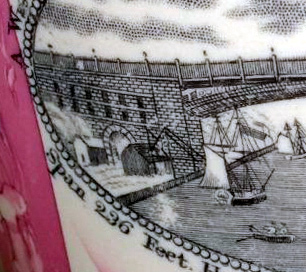 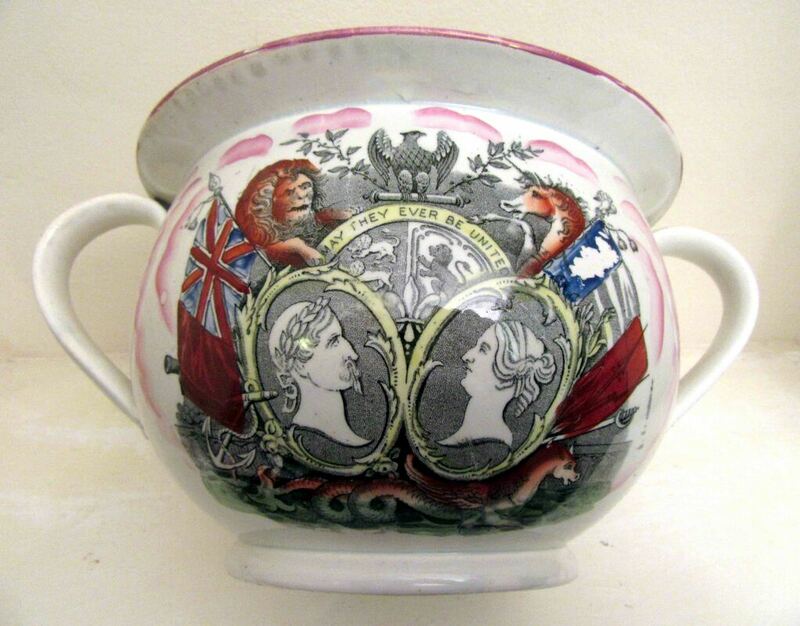 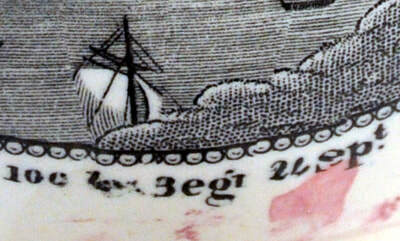 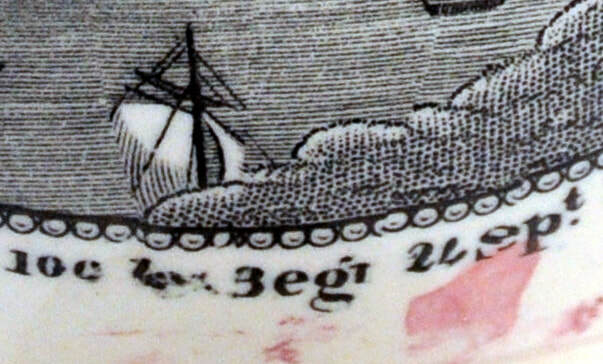 The potty has Crimean transfers, so was likely made c1855 or just after. 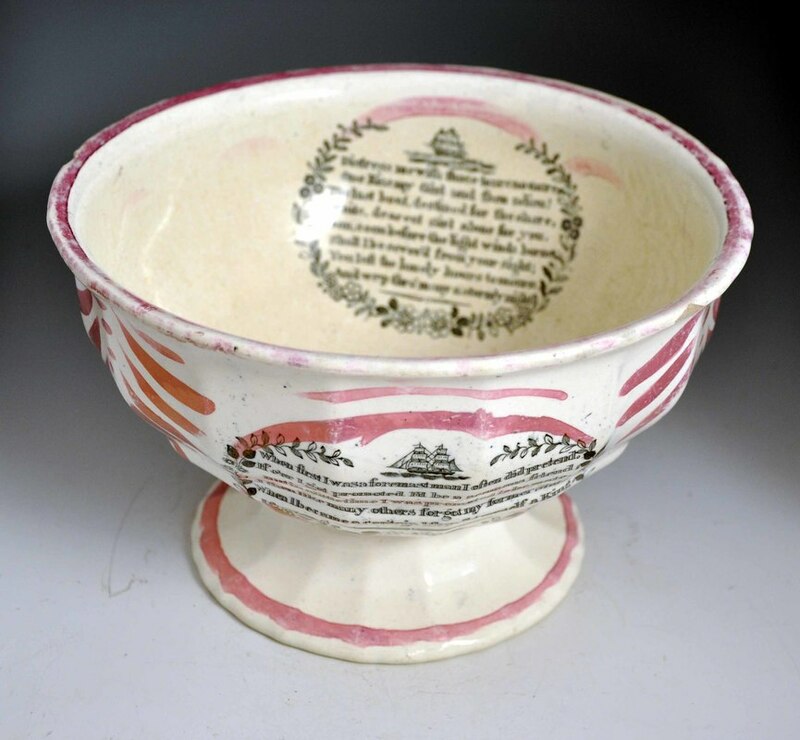 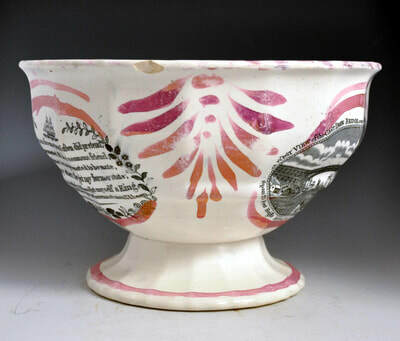 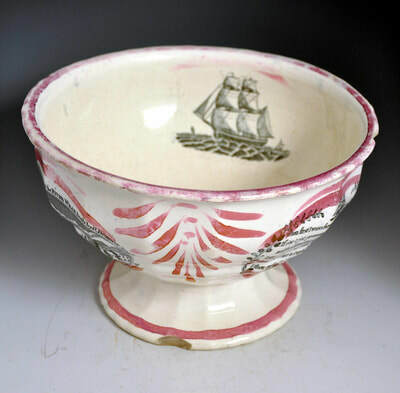 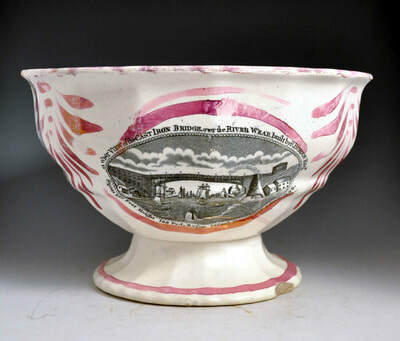 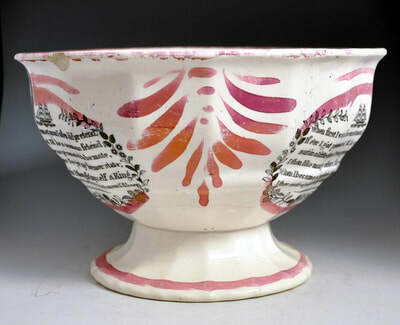 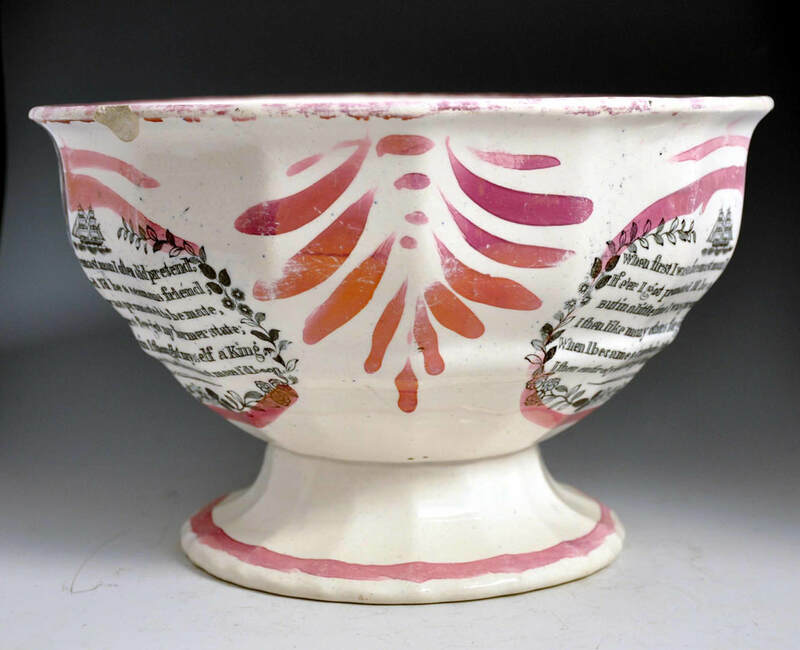 This transfer appears on a large pedestal bowl, which although unmarked, has a form and lustre decoration associated with the Garrison Pottery, c1860. 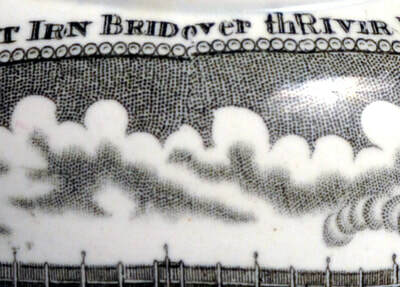 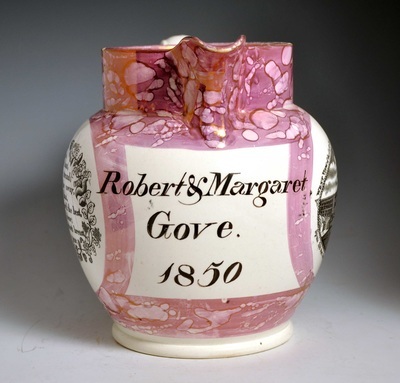 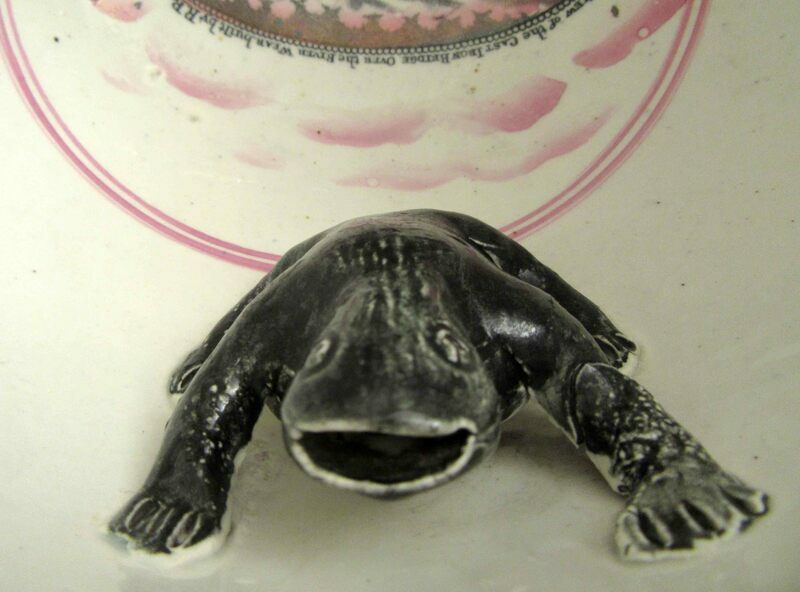 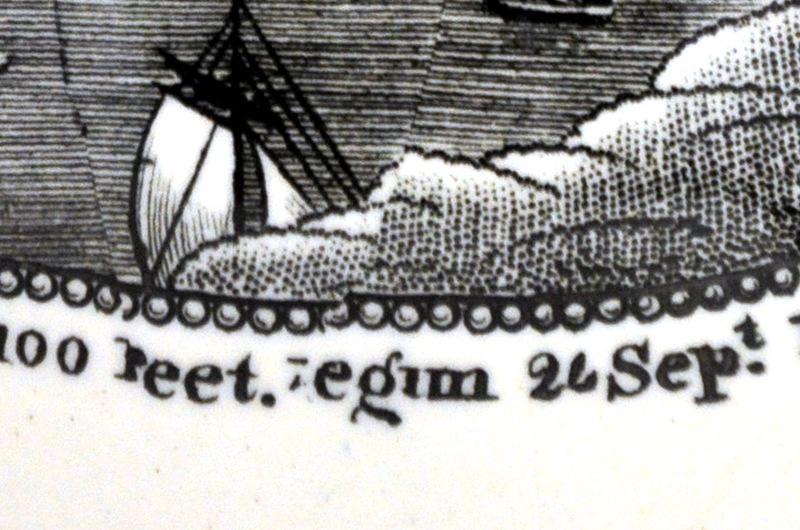 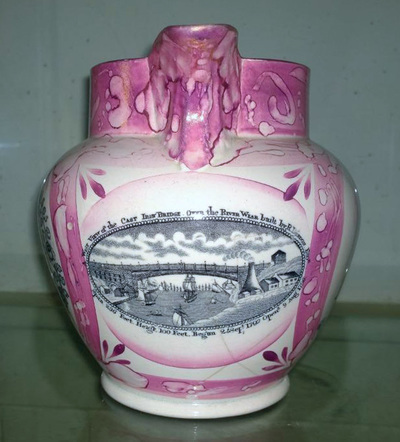 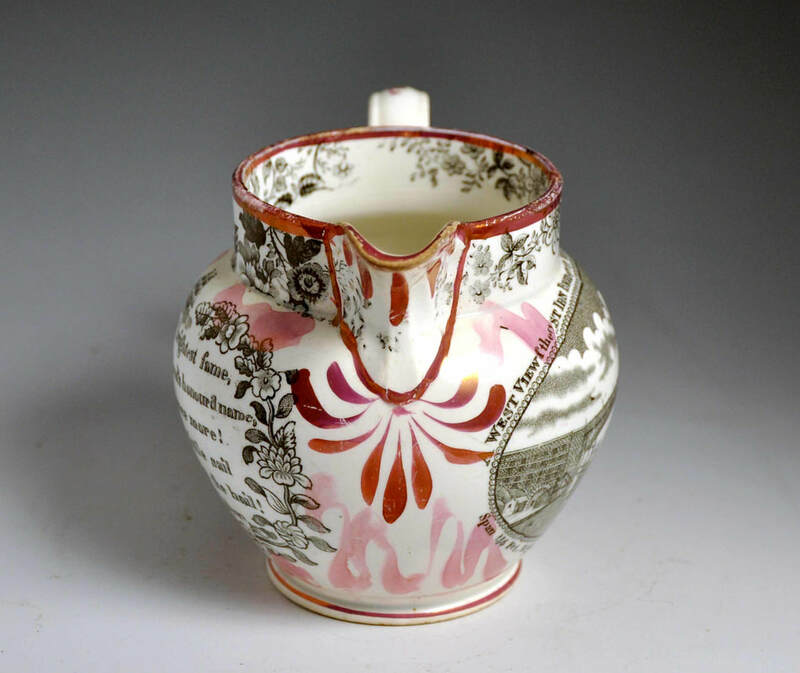 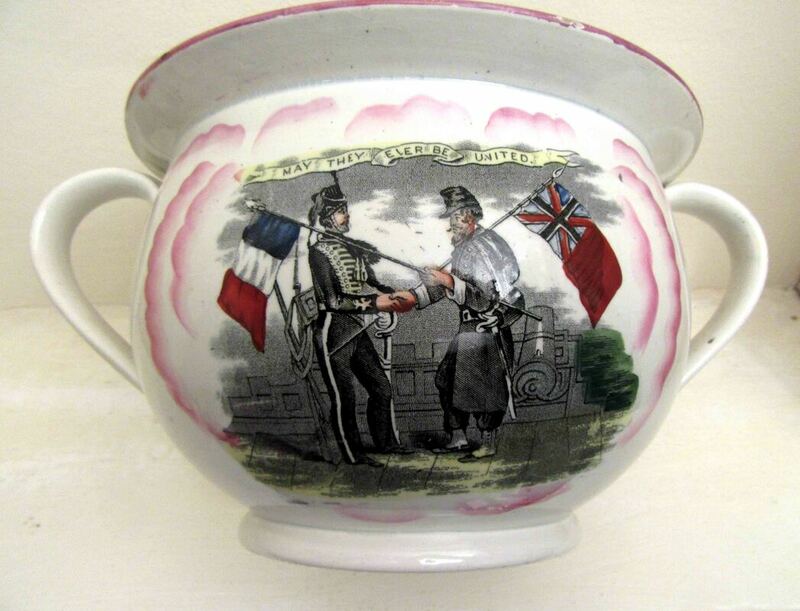 The transfer is dissimilar to the other versions from this pottery (see above). 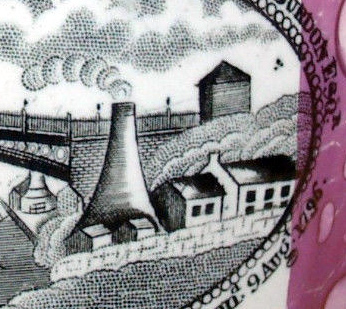 It doesn't have distinct smoke rings coming from the chimney. 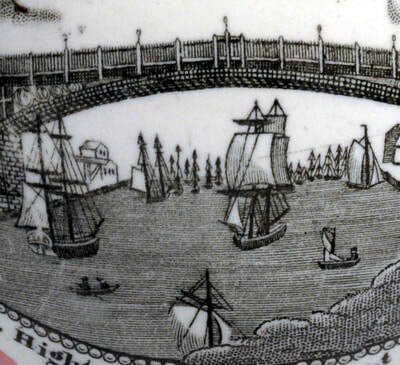 There are no railings on the left side of the bridge.